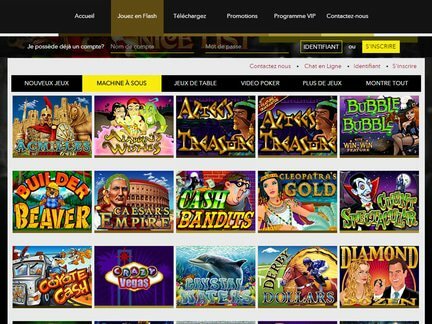 Le Bon Casino is trying to reach the French-speaking market (French Canadians might be particularly interested in the casino offer) with a carefully selected set of RealTime Gaming games. These game titles can be accessed on mobile devices as well as specialized software. Full browser compatibility also allows the player to participate in the games in instant play format. Since the company which runs the venue has already launched other successful casino brands, the expectations in regard to the website remain high among players. Time will tell whether these players will feel confident enough to become permament members of the online casino community. A nice Le Bon Casino bonus deal is offered to new visitors. It is a 100% up to $900 offer, which can be accessed using a special code (LEBON100). The offer does not apply to unauthorized games and contains certain wagering requirements. It is somewhat suprising to see that the website has refused to put out any other promotional offers as alternatives Maybe the relative short duration of the casino operation is the reason for the absence of other deals. But this is speculative, since other deals may not emerge down the road. It is also surprising that no deposit bonus offers (a common feature of Real Time Gaming casinos) are likewise absent. A careful online casino observer may even notice a lack of free spins offers. The deposit and withdrawal options show up on the main site. They would include; Credit Cards, Debit Cards, Bank Draft, Neteller, Click2Pay, Click2Pay, Western Union and Money Transfer. Some of the aforementioned services will be approved for deposits while others will be suitable for withdrawals. The website neatly divides the services. The € currency is utilized for funding the account. This shows that the casino is reaching out to players from across Europe and North America. It evidently has as plenty to offer to Canadians, especially Francophones who live in various provinces. Since the website's primary language is French, the players who speak the language can finally play at a venue which focuses on their needs. Some country-specific restrictions apply. It is best to check the website for more details about any possible access restrictions for players. The slot are particularly prominent on the website. Some of them have gained wider acceptance while others stil remain largely unknown. Here is jsut a small sample of the game title that can be located on the website; Wooden Boy, Year of Fortune, White Rhino, Wild Wizards, The Three Stooges, Texas Tycoon, The Elf Wars, Sevens and Stripes, Prince of Sherwood, Outta This World, Paris Beauty, Paradise Dreams, Ocean Oddities, Ocean Dreams, Monster Mayhem, Mister Money, Golden Retriever, Crazxy Vegas, Fruit Frenzy, Fame and Fortune, Cleopatra's Gold, Dream Run, Enchanted Garden, Bubble Bubble, Builder Beaver, Basketbull, Aztec's Treasure, Achilles, Alladin's Wishes, etc. The lack of support for other languages may be a bit of problem for the French-language focused casino. However, the players have not spoken voiced any criticism. While the silence does not equal an endorsement, it is a sign that negative feedback could be avoided by a good casino. The customer support section features e-mail support. Any possible shortcomings could be reported in the form that has been placed on the website. Curacao has the lowest cost for getting an online casino license. This may have been the reason for why the casino has chosen to stick with the jurisdiction. Unfortunately, the choice has some negative consequences. Many European countries are restricting the activities of offshore operators, which may negatively effect the traffic of the casino in the long-term. Furthermore, the process of obtaining the Curacao license is controversial. I was able to find some good quality games on the Le Bon Casino website. In my opinion, the casino's offer will be most relevant for fans of online casino slots, since this is the category that is available at the venue. The promotional section featured a single good deal. The second promotional offer was much less exciting. The absence of any other deals has been disappointing for me. Nevertheless, I have to acknowledge the fact that this casino is suitable for French-speaking visitors. This is the feature that makes it stand out.